In rapidly reconstructed cities where the pavement is ofttimes as fresh as the food, it can be difficult to visualize the complex traces of history beneath our feet. Shaping San Francisco, an organization dedicated to preserving the history of the diverse city by the Bay, leads tours to bring these complex histories to life, and one such tour is the Food Politics History Tour. But San Francisco can be a difficult city to quickly traverse, especially with a large group on foot, and bike riding a method of transport that guides Chris Carlsson and Lisaruth Elliott are well familiar with. Both are ardent cyclists — Carlsson is one of the co-founders of Critical Mass, and Elliott delivers bread with a bike trailer breadmobile for her slow food breaducation project called Lisaruth’s Lovin’ From the Oven. San Francisco is a unique food city. It’s not that New York, my beloved city for almost 15 years, doesn’t stun with its history of oysters in the Gowanus, fresh catches at the Fulton Fish Market, doubles at the West Indian bakeries, and activists in the East New York and East Village community gardens. But New York is, in my opinion, more focused on commerce and more traditional in its food leanings, while what I have found in San Francisco in my year living there and during a recent two-week trip are a more innovative restaurant culture and a focus on cooperation, activism and radical thinking. The traditional capitalist models of trading time for money at work, and money for food at a grocery store, were subverted strongly in the sixties and seventies in San Francisco. The city’s radical food traditions laid strong roots that refuse to be entirely uprooted by the now rapidly-gentrifying city. Moreover, the bounty of farms surrounding the city provide fresher produce year-round than New York, and the opportunity for a vegetable-forward California cuisine. We set out to discover the historical roots that laid the groundwork for this innovative, cooperative food scene with the wind and sun on our faces and slices of sweet, fresh heirloom tomato from a local farm in our stomachs. Carlsson and Elliott led us on two wheels across the expanse of eastern San Francisco, from the Embarcadero to the Mission, beginning at Shaping San Francisco’s headquarters at 518 Valencia. There, in the neighborhood where the first agricultural settlement in San Francisco was established, Carlsson gave us a short rundown of the abundant food histories of San Francisco. “For thousands of years, people lived in dense communities, and food was easy to find,” Carlsson said. He then recounted a story about early San Francisco settler William Richardson, who built a house in 1835 that looked down upon the water. When he and his son were sitting on the veranda looking down on the beach and the tide had gone out, they saw massive salmon and sturgeon of seven to eight feet long flopping around on the beach. Then, they were amazed to see a coyote, a wolf and a bear begin fighting for the fish. “When the cattle arrived, the grasses changed,” Carlsson said. And when fortune seekers came pouring in during the Gold Rush, people needed to eat. Carlsson told us about the history of Chinese fishermen who brought fish to the hungry masses, and eggers poached the delicious eggs of the California murre bird by the hundreds of thousands from the Farallones Islands. Carlsson discussed how Chinese immigrant food workers were thought to be taking jobs from Americans, so the Chinese Exclusion Act was passed, and then Japanese farmers came instead, who were banned from owning land. Filipino and Mexican workers followed. Carlsson detailed to us how in 1943, Italian farmers had nowhere to ply their produce, including beautiful Marin County pears. Canneries were full due to war efforts and pears were rotting on the ground. That is, until farmers markets were established — the first brought 50,000 people on its first day. Then our group of 15 or so got on our bikes and rode over the land that was once farms and marshes down to Howard and Langton to visit the Langton Community Garden, a large, sunny garden alive with gardeners and butterflies. There, we discussed the history of community gardens in San Francisco. The fascinating radical food history of San Francisco traces a line through many groups of gardening revolutionaries. The first community gardens in San Francisco were victory gardens started during the war to feed locals, and during the Gilded Age, food from the community gardens was given to the poor. The People’s Park), which grew out of sixties and seventies Berkeley protests, resulted in a community garden that was imitated across the nation. In 1981, the San Francisco League of Urban Gardeners was formed, which declared that San Francisco should have 100 gardens — and it accomplished its goal. Elliott pointed out that community gardens are responsible for the thriving of birds and bees in the city. “The western tiger swallowtail thrives because of community gardens,” Elliott said. It was a sunny day and an easy ride from Langton Community Garden over to the Folgers Coffee building at Howard and Spear, where Carlsson talked to us about the landscape of coffee before the advent of Starbucks. The longshoremen of San Francisco were known to “accidentally” break bags of coffee when they were bringing them onto the docks, resulting in the phrase “longshoreman’s coffee,” wherein a longshoreman would invite you over and roast green coffee beans on his stovetop, then pour hot water over them. The longshoremen were eventually replaced by mechanization, which ensured no stolen coffee beans. Carlsson also told us about the history of the waitresses who poured the coffee into our cups. “In 1941, you couldn’t go to a restaurant without a union waitress pouring your coffee or a union busboy clearing your table,” Carlsson said. 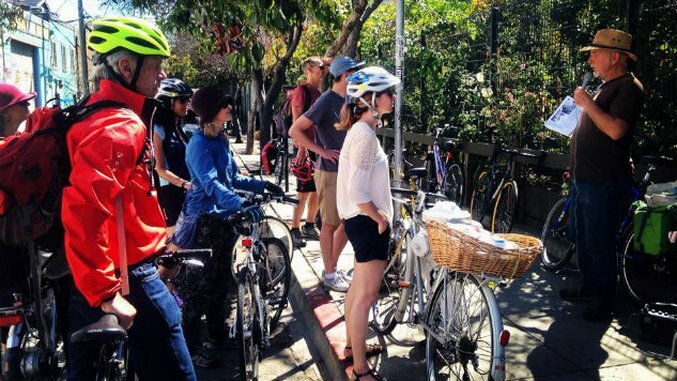 After a stop at the Del Monte building at Mission Creek to learn about the “Dear Del Monte” letters and the history of the SLA demanding food distribution, we rode to the corner of Alameda and 14th, where we learned about bread, breweries and butchertowns. A Costco across the way was once the site of five different breweries. One of those companies was Anchor Brewing Company, which pioneered steam beer, a beer once considered a blue-collar beverage. Steam beer, we were told, was pioneered by Gottlieb Brekle, who wanted to make lager beer, but couldn’t commit to costly cold fermentation (the Sierra Nevada mountains had ice, but the cost of its transport was too high). Steam beer was easier to make, with its warmer fermentation temperatures, and thus didn’t cost the worker (or Brekle) a pretty penny. We learned about the history of artisanal bread in the city. The city’s bread scene has as of late been ruled by Tartine, the famous bakery that has opened Tartine Manufactory, a hip new bread bakery and cafe, but the city’s artisanal bread roots lie, of course, in sourdough, with the founding of Boudin Bakery in 1849, which made a French sourdough. The influence of 1970’s The Tassajara Bread Book from the Tassajara Zen Mountain Center several hours south of San Francisco was life-changing for bakers who were learning to switch to whole grains and wanted to create light, fluffy, delicious breads. The resurgence of the modern artisanal bread movement in San Francisco started with the founding of Acme Bread in the 1980s and their usage of a yeast from wine grapes as a starter. By 2001, there were 65 microbakeries in the Bay Area and business was booming at Acme, The Cheese Board and Arizmendi. As we listened, we filled our hungry stomachs with fresh bread made by Elliott. Soon, we were back on our bikes, and with the effort of a pedal in our legs and a fellow interested food lover to chat with on the next bike over, the afternoon surpassed the educational and became a pure pleasure. I mentioned that I was staying in Sea Cliff, and I was informed by my fellow rider that I couldn’t miss the Richmond farmer’s market, which offered rare Chinese fruits and vegetables. Another rider recommended that I skip the line at Burma Superstar and eat at Mandalay, another Burmese restaurant in the Richmond. A few blocks down at Alabama and 20th, we paused across from the long-running community spot Atlas Cafe to talk about the Peoples Food System, an important historical step people took from bulk-ordering food conspiracies to cooperatively-owned stores. Many of the cooperatively-owned grocery stores you see in the Bay area today are participants or inheritors of this food system. And grocery stores are not the only cooperatively-owned businesses in San Francisco — cooperative food extends to Arizmendi Bakery, a cooperatively-owned bakery proffering blissful sourdough, scones and brioche under its “Make Loaves, Not War” sign, and The Cheese Board, a Berkeley cheese shop overflowing with cheese of every flavor and source. Our last stop was at a farming mural located on the back wall of a locally-sourcing bakery called Mission Pie. There, we discussed locavorism, Pie Ranch, the Hayes Valley Farm, the Free Farm Stand and gleaning. We locked up our bikes and enjoyed local San Francisco beers and pie made partially from locally-sourced wheat. My bike ride back to the Bike Hut, the bike non-profit on the Embarcadero where I had rented my bike, felt different from my ride to the Mission; in my year living here, I had often biked this city, but now I looked at the tents of the homeless and knew that the Free Farm Stand offered food to those displaced by the Great Recession and the ongoing San Francisco eviction struggle. And as I cycled past large, inscrutable warehouses and peered into their tinted windows, I now knew what food secrets their histories held. Dakota Kim is Paste’s Food Editor. Tweet her @dakotakim1.